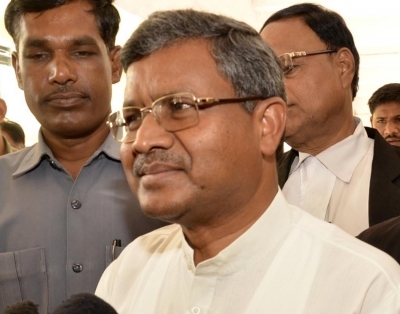 Ranchi, April 15 (IANS) Former Jharkhand Chief Minister Babulal Marandi on Monday filed his nomination paper from the Koderma Lok sabha seat. The grand alliance's important leaders were present when he filed his papers. They included JMM President Hemant Soren, Congress state President Ajay Kumar and Congress Ranchi Lok Sabha candidate and former union Minister Subodhkant Sahay. After filing his nomination papers, Marandi told reporters: "Our fight is against the lies of the BJP government. In 2014, two crore jobs were promised. Where are the 10 crore jobs? We have to oust the Modi government." Marandi was the first Chief Minister of Jharkhand from November 2000 to March 2003. He was elected to the Lok Sabha for a third time from Koderma in 2004. Marandi will face BJP's Annapurna Devi in the electoral contest.